Advance Mini Adult Dog Food Chicken & Rice is a comeplete dog food specially formulated for adult small breed dogs between 8 months and 8 years with an adult weight up to 10kg. Advance Mini Adult Dog Food has high protein and fat content as small breeds need a greater supply of energy than larger breeds to fulfil their needs due to greater activity. This blend incorporates special ingredients which helps develop strong muscles and an athletic build. With 20% chicken and 15% rice as main ingredients for optimum digestion, the formula is an excellent source of carbohydrates. Heart health can benefit from taurine, an amino acid that improves proper heart function. Thanks to its special minerals (pyrophosphates), this recipe maintains the oral hygene of your dog, preventing from tartar build-up and promoting fresh breath. This small kibble from Advance is recommended for small breed dogs with an adult weight up to 10 kg. As small dogs require more energy than large breeds, it is important to provide them specific diet enriched with proteins and vitamins. 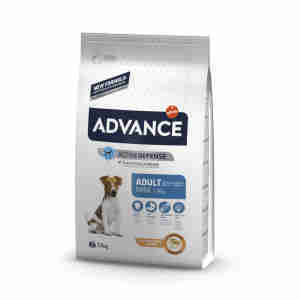 Advance Mini Adult Dog Food is adapted to the jaws and teeth of small breed dogs and helps maintain joints flexibility. Chicken (20%), rice (15%), dehydrated poultry proteins, wheat, maize gluten,animal fat, haize, Hydrolysed animal proteins, beetroot pulp, fish oil, dehydrated egg, yeast, potassium chloride, plasma proteins, tetrasodium diphosphate, calcium carbonate, salt, natural polyphenols. Vitamin A 27000 IU, Vitamin D3 1800 IU, Vitamin E 670 mg, Vitamin C (Ascorbyl monophosphate calcium sodium salt) 500 mg, Taurine 1200 mg, Ferrous sulfate monohydrate 260 mg (Fe: 85 mg), Potassium iodide 1.9 mg (I: 1.4 mg), Copper(II) sulfate pentahydrate 34 mg (Cu: 8.8 mg), Manganese sulfate monohydrate 124 mg (Mn: 40mg), Zinc sulfate monohydrate 395 mg (Zn: 144 mg), Sodium selenite 0.24 mg (Se: 0.11 mg), With antioxidants. Protein 28.0%, Fat content 19.0%, Gross Fiber 2.0%, Inorganic matter 6.5%, Calcium 1.3%, Phosphorus 1.0%, Humidity 9.0%.